I have to finish the binding — I was waiting for labels I ordered to arrive. :> I tried to make a solid rainbow block, but ended up not liking it too well. I think it looks okay as the back of a potholder, though… and hopefully I’ll make another potholder by Sunday. Gogo, cheerleader effect! I just started cutting fabrics for this. 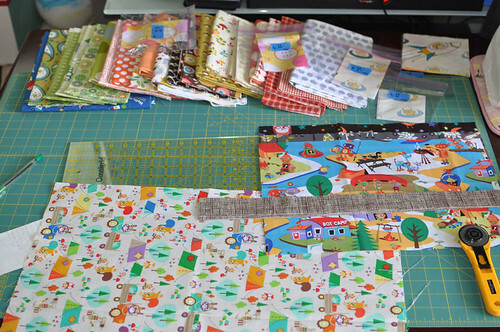 Fussy cutting takes me forever, and sometimes I find myself just staring into space. I basted this at my mom’s this weekend and then got a couple of quilting lines down. 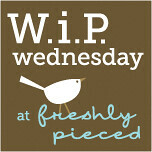 It’s too bad I didn’t wait till Chasing Cottons posted her basting tutorial… for some reason, even though I know you’re supposed to start quilting from the center, I got it in my head that you start pin basting from one end of the quilt. Now I know better for next time! Anyway, I got tired of the painters’ tape unsticking since I was wiggling the quilt around a lot, so I tried using a crease-maker thingy that I had from when I tried bookbinding since I’ve been reading how nicely hera markers work. 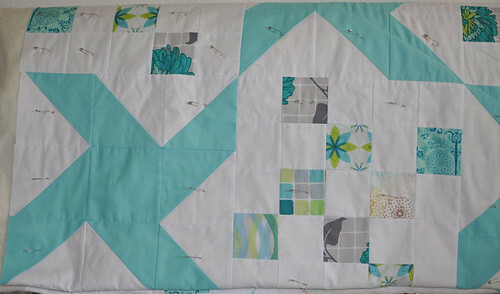 I love aqua so much to start with, but right now with this heat, I doubly love white and aqua quilts!! 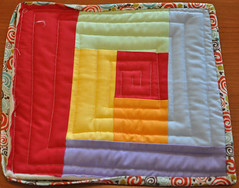 Love the fresh colours in your “Full swing” quilt! Love the colors in the Full Swing quilt. 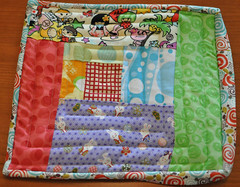 Your full swing quilt looks lovely! Love the fabric choices/colors and design! These are nice projects! I love the quilt you are making for your grandmother!